I went through an extended period last year during which I had difficulty praying. The stretch lasted many weeks in which I couldn’t find the words to speak to God as I usually did, couldn’t sit silently in His presence as I usually did because I wasn’t certain He was there and struggled simply to say the words even of routine prayers because of an overwhelming sadness that gripped my soul. Jump out of an airplane. Now, it’s a good idea to be attached to a parachute, mind you! In my case, I was all hooked up to an experienced sky diver — the young man from New Zealand had made more than 2,300 jumps in his life — and the parachute was attached to him. Believe me, you find yourself almost forced to pray at least a little when you commit to sky diving. It happened somewhat unexpectedly for me in August 2013. I had told my daughter Erin that I had wanted to take such a leap for my 50th birthday. Alas, I turned 51 two months earlier, I said, so the opportunity had passed. Darn the luck! As we were planning a quick late-summer vacation to Napa Valley — my wife Donna, Erin and me — Erin did an online search for sky-diving opportunities in that area. Of course, she found one, in Lodi, Calif. She made reservations for all three of us, and that’s about the time my praying began. * Pray for someone else. Don’t think about yourself. Rather, ask God’s blessing for someone you love. There was a time when a particularly dear friend was dealing with several crises all at once. I felt helpless yet wanted to be of some service and comfort for her. With no other options, I began to ask God to help ease her pain, to bring her peace, to be there for her in ways that I couldn’t. Suddenly, I felt a little more connected — to her and to God. * Take the leap. You might scream or you might be quiet. You might find words for that moment’s experience or simply cry. You might feel able to trust that He hears you or you might not really know for certain. Take the leap anyway. Just go. 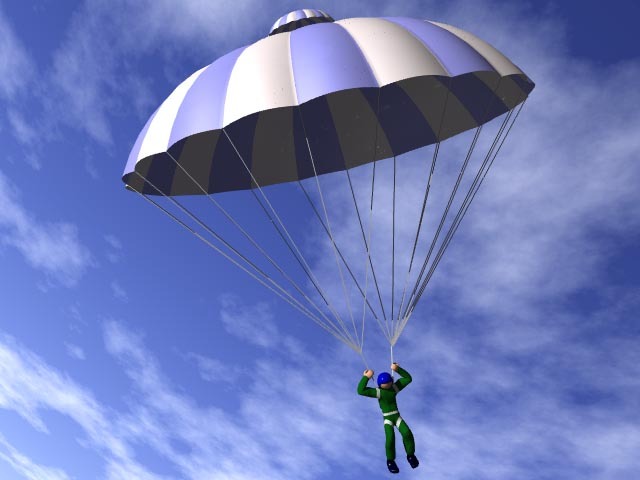 As for my moment 14,000 feet above ground, I jumped and spent 55 seconds in freefall as I was plummeting about 120 mph. The cloudless sky was a beautiful blue and the earth below was mostly filled with fields of grapes. It felt wonderful.